The California Department of Toxic Substances Control (DTSC)The department within the California Environmental Protection Agency in charge of the regulation of hazardous waste from generation to final disposal. DTSC oversees the investigation and cleanup of hazardous waste sites. 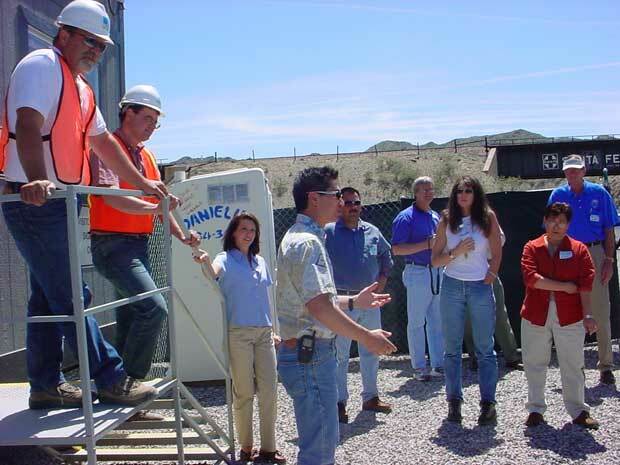 meets regularly with stakeholders, including the Consultative Workgroup (CWG) A group consisting of stakeholders and multiple state and federal agencies that have an interest in the cleanup of a contaminated site, and meet regularly to discuss actions and make decisions., the Technical Workgroup (TWG)A focused stakeholder subgroup of the Consultative Work Group (CWG) where various stakeholders and their consultants discuss technical project related issues in greater detail which are then reported back to the CWG., and the Clearinghouse Task Force (CTF)A group formed to develop and implement processes and tools to improve communications and enhance Topock stakeholder understanding of project technical and regulatory information., and the Topock Leadership Partnership (TLP)Forum that enables senior officials to provide input to the regulatory agencies on the direction of actions necessary to complete the Topock project.. DTSC has conducted extensive public involvement pursuant to the 2013 Community Outreach Plan regarding investigation and cleanup activities at the Topock Compressor Station (Station) and adjacent land, collectively known as the Topock Project Site (Site). These activities include hosting briefings and Site tours for Tribal Nations, elected officials, and federal, state, county, and city agency staff. Fact sheets and newsletters have been produced and are available in Information Repositories and in this website’s Document Library, which are updated regularly. Project documents can also be obtained by contacting DTSC. To download documents from this website, please visit the Document Library. Fact sheets are distributed to elected officials; agency staff; residents of local communities, including Golden Shores, Topock, and Lake Havasu City, Arizona; and 10 Native American Tribal Nations, including the Fort Mojave, Chemehuevi, Colorado River, Fort Yuma-Quechan, Cocopah, Havasupai, Hualapai, Torres-Martinez Desert Cahuilla, Yavapai-Prescott Indian Tribes, and the Twenty-Nine Palms Band of Mission Indians. A Public Participation Plan was first published in June 1998, and an Updated Public Participation Plan was published in February 2007. An Addendum to the Public Participation Plan was prepared in July 2009. The Department of the Interior prepared their Topock Community Involvement Plan in October 2012. A Community Outreach Plan (COP) was published in January 2013 which superseded previous Public Participation Plans. The COP included the results from the Topock Community SurveyA survey prepared by DTSC and distributed to the community surrounding a project site. The survey is a tool to gather information about the community’s level of awareness and interest in a project site, understand specific concerns about a project site and to gather project specific public involvement questions or concerns. that was sent to the public in January 2012. The 2012 Topock Community Survey can be found in the Document Library and at the Information Repositories. The 2013 COP can also be found in the Document Library and at the Information Repositories. To maintain an open channel of information to the community and the public, DTSC has held and will continue to hold periodic community Open House Workshops, public meetings, and hearings for the Project. In June 2010, DTSC held several Open Houses/Public Hearings in local communities surrounding the Station, including the following: Parker, Lake Havasu City, Needles, and Topock. DTSC and the U.S. Department of Interior (DOI) jointly hosted a Community Meeting and Open House at Golden Shores in Topock, Arizona on December 12, 2011, to update the community on the PG&E Site. Click here to see the presentation provided at the meeting. DTSC hosted two public meetings on July 22 and 23, 2014, in Needles, California, and Golden Shores, Arizona, respectively, about the Soil Investigation Project draft EIR and accepted public comments at those meetings. In April 2016, an Open House was held at Moabi Regional Park for part-time residents and visitors, to inform the community about the PG&E site and to update the community on the groundwater remedy and soils investigation. These Open Houses and public meetings provided an opportunity for the community and the agencies to engage in discussion regarding the status of the Topock Project as well as a venue for communities to learn about this unique site and to provide input. DTSC also held several public meetings on May 19 and 20, 2015, in Needles, California and Golden Shores, Arizona and a Tribal focused meeting on May 19, 2015 where the public and the Tribes could learn more about and provide input to help scope the environmental issues addressed in the Draft Subsequent EIR for the groundwater remedy. DTSC also held two open house/public hearings on January 31, 2017 in Needles, California and February 1, 2017 in Golden Shores, Arizona, to provide information and received comments on the Draft Subsequent EIR. Click here to view Fact Sheets and other Public Outreach documents.